Years from now, it will become one of those where-were-you questions. There must be thousands of Indians who remember what they were doing when Sunil Gavaskar late-cut Ijaz Faqih at the Motera Stadium, just as legions of Pakistanis will recall the moment Ramiz Raja stared at the Melbourne sky and positioned himself under a skier from Richard Illingworth. Sri Lankans already have one such moment, at the Gaddafi Stadium in 1996, but this one ranks right up there. The perfect exit for the country's greatest cricketer. Even the denouement was appropriate - c M Jayawardene, b M Muralitharan for the 77th and final time. A couple of years ago, at a function at the Tamil Union Club in Colombo, Chandra Schaffter spoke to some of us at length about its history and the role it had played in Sri Lanka's cricket. From Sir Donald Bradman's visit in 1948, through innumerable brilliant innings played by Mahadevan Sathasivam, to the riots of 1983, there was little that Schaffter's memory didn't dredge up. 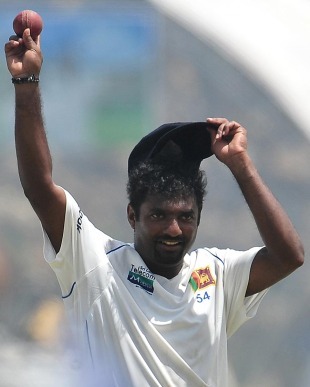 After evoking yesteryear's greats, he said: "Then, of course, in the early 1990s, Murali came down from Kandy." He didn't need to say more. The modern history of Sri Lankan cricket is merely an extension of Murali's career. Aravinda de Silva's class and Arjuna Ranatunga's pugnaciousness were in evidence in the '90s, and Sanath Jayasuriya's devastating hitting illuminated a decade from '96. Chaminda Vaas was Tonto to Murali's Lone Ranger for most of his career, while Mahela Jayawardene and Kumar Sangakkara carried forward the flame of a batting tradition that dates back to Sathasivam and Fredrick de Saram. But while others came and went, Murali was the constant, the heart of a team that had found its place and voice in world cricket. Murali may leave behind records that will never be broken, but he was never selfish. Time after time, he bowled himself into the ground for the team cause, and it was perhaps fitting that the final furlong to 800 was the hardest. In the first innings he needed just 102 deliveries for five wickets. The three in the second required 44.4 overs. When VVS Laxman was run out, leaving India nine down and many in the crowd on tenterhooks, Murali merely smiled and celebrated with the other fielders. A lesser man would have been a bundle of nerve fibres, but Murali looked as calm as someone who knew that nothing could come between him and his destiny. From the painfully shy hill-country boy who used to beg his captain to take him off so that he wouldn't have to front up to journalists' microphones if he took a bunch of wickets, to a chatty senior statesman with a wicked sense of humour, Murali's journey has been nothing short of remarkable. In Test cricket alone, he bowled 44,039 deliveries, more than twice as many as Bishan Singh Bedi, the most prolific of India's famous spin quartet from the 1960s and '70s. When he wasn't harvesting wickets by the bushel, Murali was dodging the critics' darts. Those that hold him responsible for legitimising "illegal" actions - Bedi among them - miss a very important point. The laws were not changed to accommodate Murali, they had to be tweaked because the research done on his action revealed that even those with "clean" actions straightened their arms more than 10 degrees. Then there were the jibes about wickets against Zimbabwe and Bangladesh, as though it was Murali's fault that the Future Tours Programme is a joke that denies Sri Lanka and several other teams a level playing field. Was it his deformed elbow that ensured he never toured South Africa after December 2002? Or the suppleness of his wrists that was responsible for Sri Lanka never playing a Test at the spin-friendly SCG? A lesser man would have lashed out far more often. It's to his eternal credit that Murali rarely bothered to respond to the barbs. At the post-match presentation in Galle, he had another opportunity, when Tony Greig mentioned the umpires who had no-balled him all those years ago. Murali responding by talking of the naked eye, and them having to "do a job". If only those that belittle him had that kind of class. My favourite Murali memory will be of an evening a few years ago. Feeling peckish before an interview, he had room service at the Taj Samudra in Colombo. When the food - simple fare of rice and dhal - was laid out on the table, the bearer gave him the bill. Murali grimaced looking at it. "650 rupees for dhal? It's made of gold or what?" As the bearer stared at the floor uncomfortably, Murali smiled and exchanged a few pleasantries. You could see the man's mood change. By the time he left the room with the tray, his chest was puffed out and you could be sure that his colleagues would have had to endure multiple retellings of the evening Murali spoke to him. Treasure the 800 wickets, but remember, too, the 1024 houses he built for those whose lives were devastated by the tsunami. They say more about the man than his athletic achievements ever will. Also recall the joy with which he played the game, the childlike delight that accompanied each plotted dismissal, the skip and jump into a team-mate's arms. Neville Cardus once said of Learie Constantine: "When Constantine plays the whole man plays, not just the professional cricketer part of him. There is nothing in the world for him when he bats, save a ball to be hit -- and a boundary to be hit over. When he bowls, the world is three wickets, there to be sent spinning gloriously. Cricket, indeed, is Constantine's element; to say that he plays cricket, or takes part in it, is to say that a fish goes swimming. Constantine is cricket, West Indian cricket..."
For nearly two decades, Murali was Sri Lanka's Constantine, the prime factor in his nation wresting respect from a grudging world. There are a few more one-day scalps to claim and Twenty20 batsmen to embarrass. But for now he can put his feet up and contemplate a job that no one could have done better. Top of the world on the field, and a different class off it. Truly one of a kind.